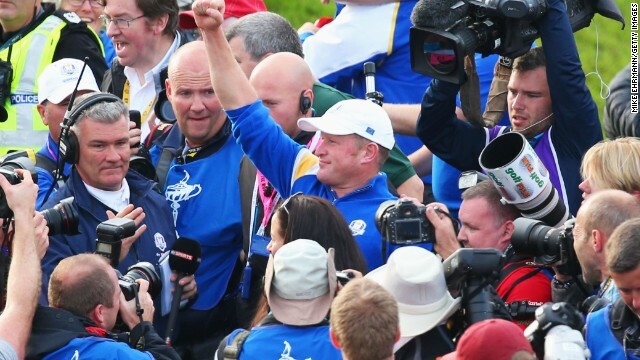 Gleneagles, Scotland (CNN) -- European momentum endures at the Ryder Cup, despite a brief reality check. 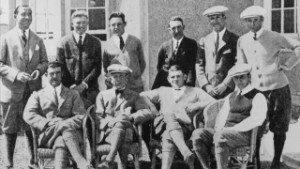 Two years on from the "Miracle of Medinah", those in blue responded to an early blow from its American opponent to end a breathless day in prime position. 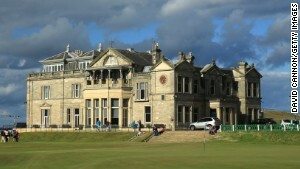 As the sun dipped below the Ochil Hills in Scotland, Europe carved out a 5-3 advantage, roaring back in an afternoon session that spoke of the continent's deep reserves. That the pairing of world No. 1 Rory McIlroy and No. 3 Sergio Garcia scrambled desperately to grab a tie in their afternoon match, having lost in the morning, underlines the point. New heroes were born — rookies Victor Dubuisson and Jamie Donaldson among them — as familiar fault lines in American ranks were exposed once more. 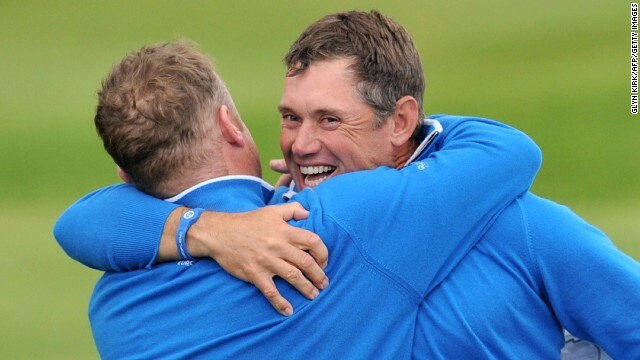 It was actually the first pairs session victory Europe had enjoyed since 2010, and the best foursomes win in their history, after the U.S. had secured a morning lead of 2½ - 1½. 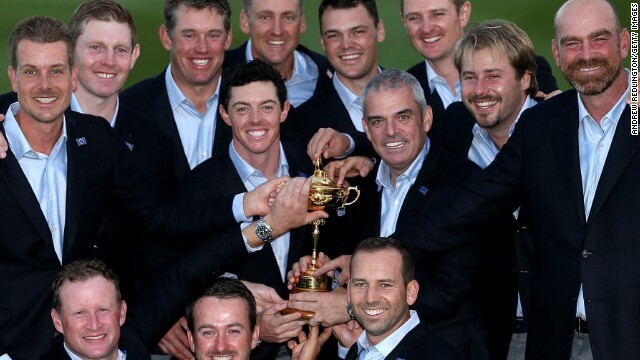 What does it take to win the Ryder Cup? 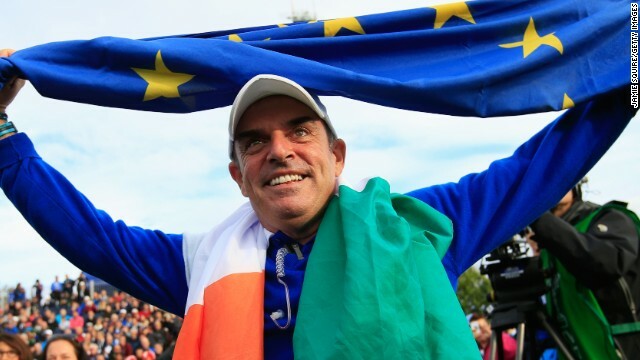 No wonder European captain Paul McGinley ended the day displaying that trademark grin of his. "Today shows how important momentum switches are and how it can have a domino effect. 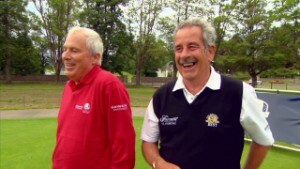 For our guys to respond as well as they did shows a real strength of character," McGinley told reporters. "For me it's not about two points dropped if (McIlroy and Garcia) lost, but they went out this afternoon and rectified this morning -- it was probably as good as a win from where they were. "It's not a perfect science, but two out of three rookies (winning) isn't bad. 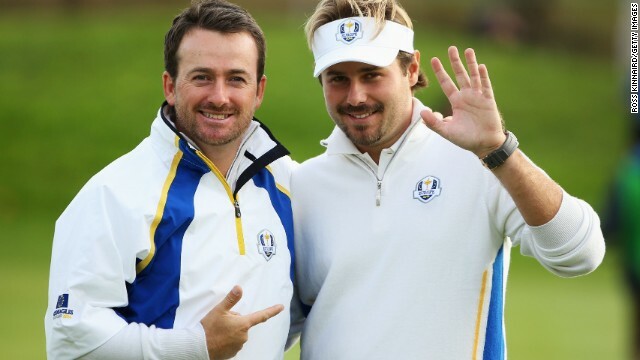 The afternoon rookies had great partners in Lee Westwood and Graeme McDowell — there aren't better guys on your shoulders in a Ryder Cup. "It's a great day but let's take stock — we have a big day tomorrow." 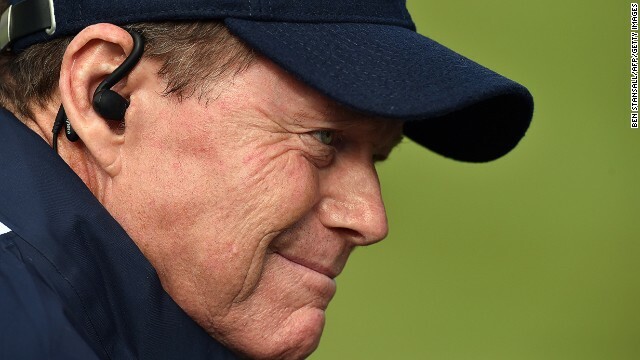 Not a single slice of red could be seen at the conclusion of the afternoon matches, which will no doubt cause McGinley's counterpart Tom Watson a bout of introspection. 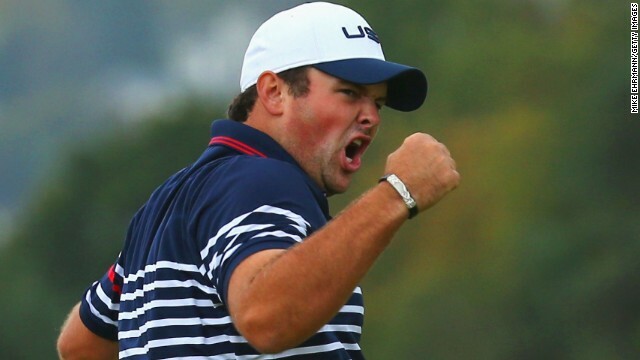 In the morning, the rookie pairing of Jordan Spieth and Patrick Reed had shot down Ian Poulter, nicknamed Europe's postman because he always delivers. 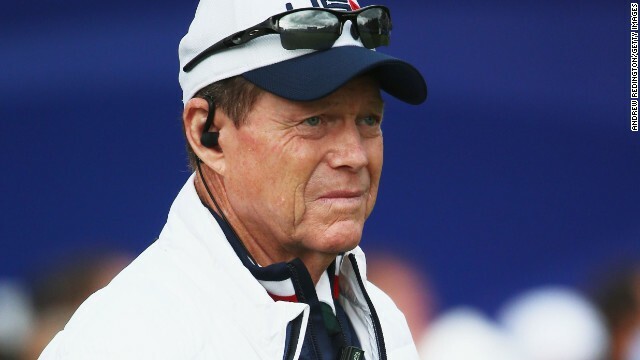 Yet after comfortably disposing of Poulter and Scotland's Stephen Gallacher the American pair were rested for the foursomes contests -- Watson later conceded the error of judgment. 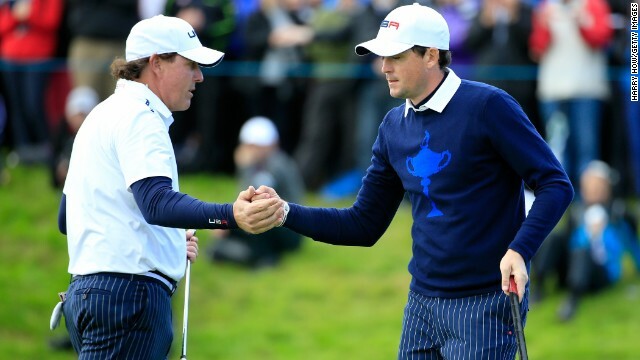 Meanwhile Phil Mickelson and Keegan Bradley showed signs of fatigue as they surrendered their 100% record as a pairing to Graeme McDowell and European rookie Victor Dubuission -- they had earlier dispatched Europe's gun pairing of McIlroy and Garcia. 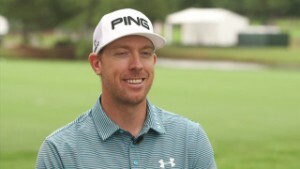 The one afternoon match that had seemed a U.S. banker was the one that pitted rookie Jimmy Walker and world No. 10 Rickie Fowler against that gun pairing. 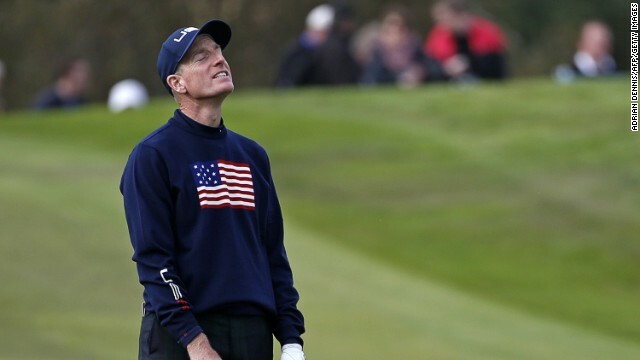 Two up with three to play, and with the European pair hell bent on redemption, the American's conservatism when trying to close out the match opened the door. McIlroy birdied 17 before an arrowing second into the 18th from Garcia put pressure on Walker to hole a final putt to win the match. He couldn't, and their opponents could breathe a sigh of relief. "We owed each other a lot," Garcia told reporters. "We knew we weren't playing great but fought as hard as we could and half a point is huge." The day had begun in darkness, spectators dashing through the gates at 6am, desperate to secure a seat in the grandstand around the first tee. 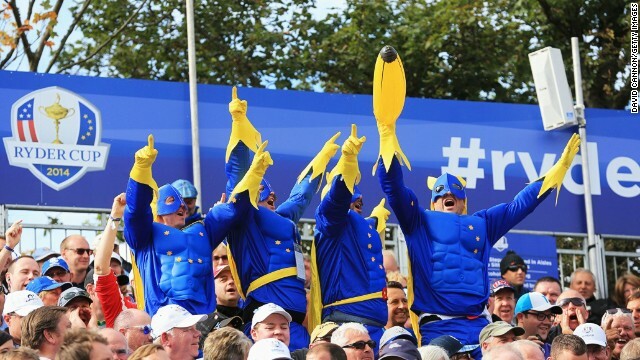 By quarter past there wasn't a spare seat to be had, by half past the 2,500 strong gallery were in full voice and by the time the captains arrived on the tee, excitement was palpable. 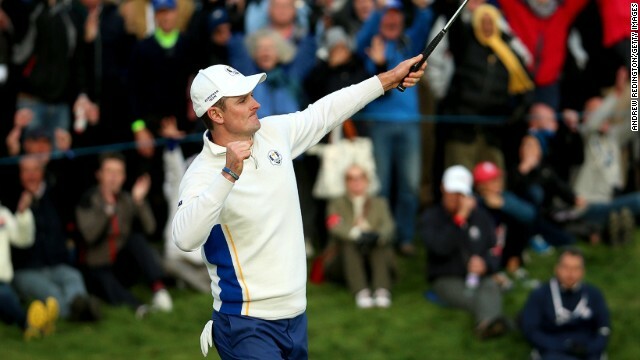 Former U.S. Open champion Justin Rose and Sweden's Henrik Stenson lapped up the acclaim as they made the long walk from the range to the tee, through a tunnel bedecked with images of Ryder Cup legends gone by. 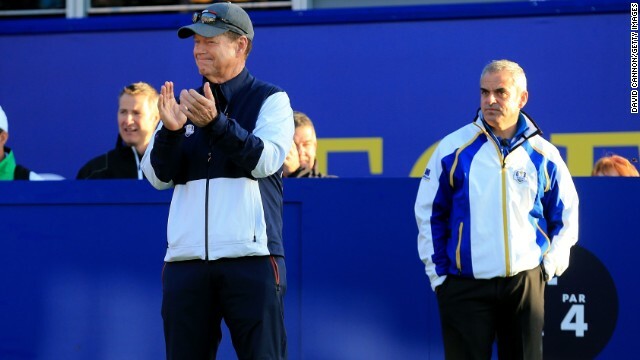 The honor of hitting the first ball of the 40th instalment of the Ryder Cup fell to another ex-U.S. Open champion, Webb Simpson, who mishit his shot, before Bubba Watson again encouraged ear-splitting noise from the crowd as he crunched a drive into the rough. The European pairing were less wayward but after a halved first hole they grabbed the initiative on the second hole and didn't let go. Stenson, the 2013 FedEx Cup winner, proved the difference on the second hole, Rose the difference on the fourth — a rapier-like approach yielding another birdie. 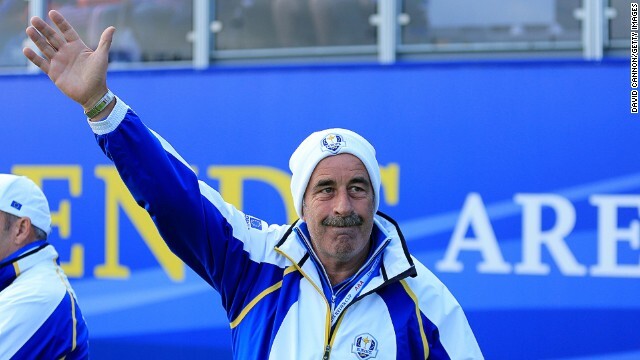 Two more birdies, on nine and 10, took the match out of Watson and Simpson's reach, the first point of Scotland's Ryder Cup secured with another birdie on the 14th. It didn't take long for the U.S. to respond. 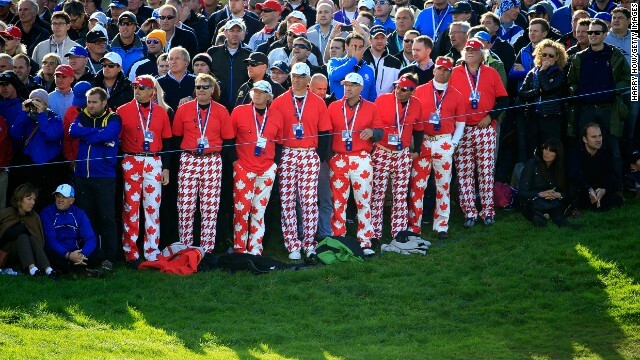 Poulter's "postman" tag preceded him on the tee. 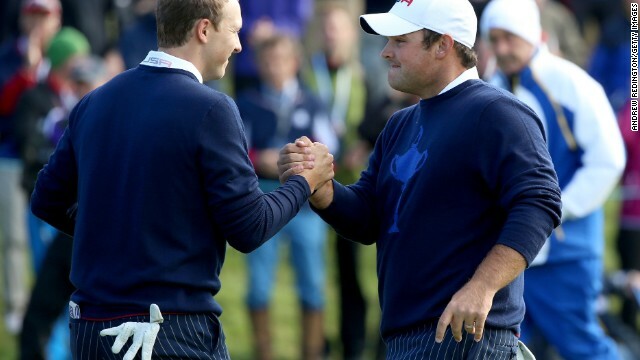 But the rookie pairing of Jordan Spieth and Patrick Reed paid no heed to the Englishman's reputation. 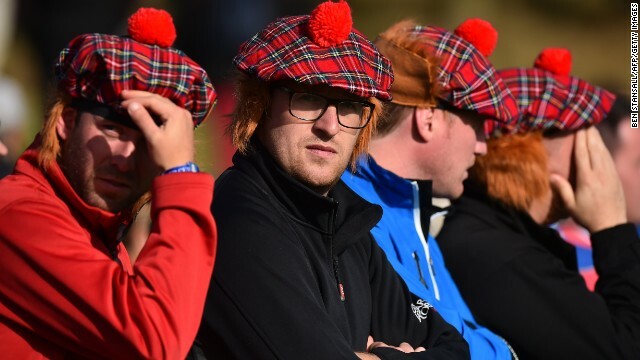 Despite earning the loudest cheers thanks to the presence of Scotland's own Stephen Gallacher, Poulter and partner fell behind on the first and failed to rally. 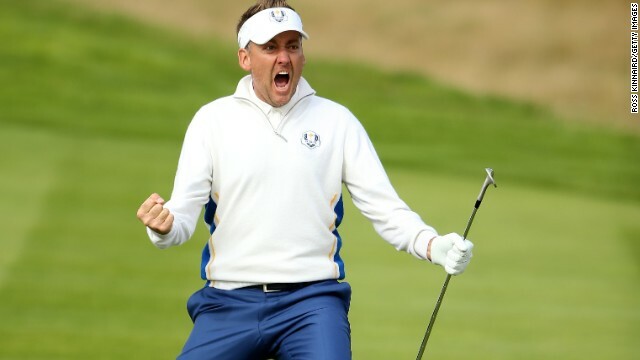 A stretch of five birdies in six holes chipped away ever so slightly at Poulter's mantle, Gallacher perhaps overcome by nerves on his own Ryder cup debut. 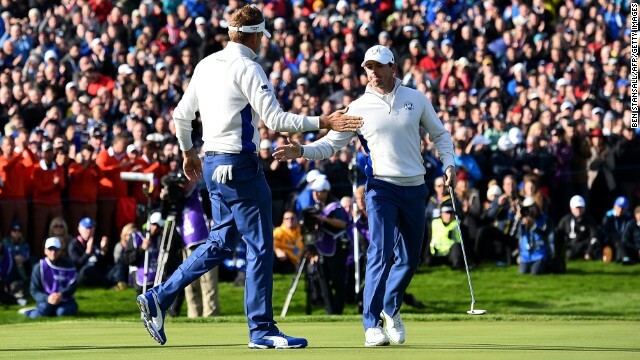 A victory, secured by the same 5&4 margin Rose and Stenson had managed, answered that early European pressure. 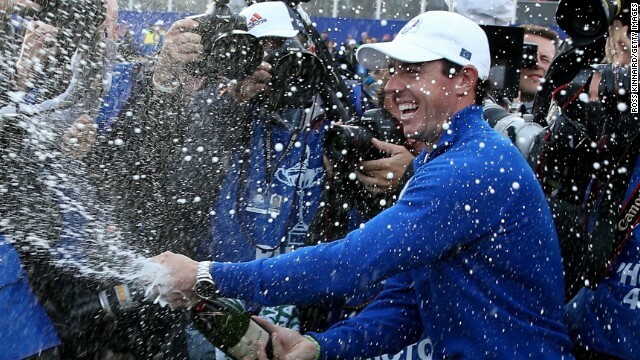 Behind them McIlroy and Garcia were locked in a ding-dong battle with Phil Mickelson and Keegan Bradley, who put their unbeaten Ryder Cup record on the line. Having lobbied McGinley for months to play together, McIlroy and Garcia prised out a one-hole lead after the Spaniard chipped in on four. 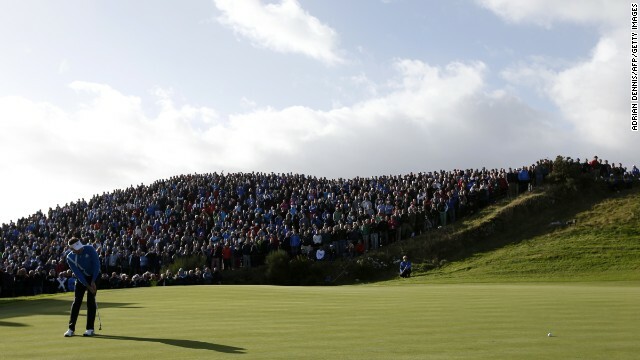 But by the 10th, Mickelson and Bradley had established a two-hole lead, erased by European birdies on 11 and 13. Another McIlroy birdie on 15 titled the balance towards the blue half but Bradley's brilliant eagle on 16 ensured they would go up the last all flat. 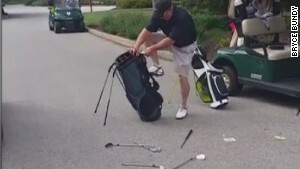 None of the four played it spectacularly, but it all came down to the match's final blow, which Mickelson duly dispatched to maintain that winning streak for a few hours at least. For a long while it looked like Europe would also be able to boast two points after the morning session as U.S. Open champion Martin Kaymer, from Germany, and Denmark's Thomas Bjorn raced into a three-hole lead. 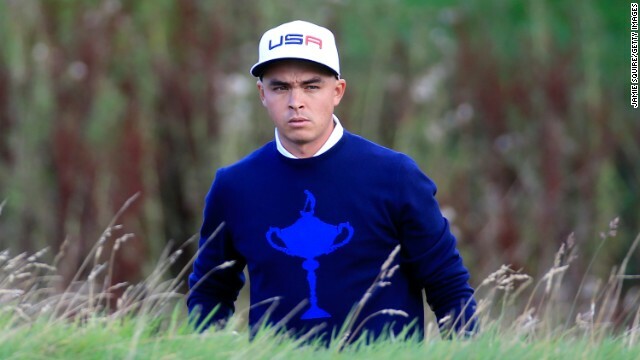 But Rickie Fowler and his partner Jimmy Walker hung in, and despite going two down on the 13th, the latter — a rookie — showed firm resolve to sink a birdie putt on the last and secured a vital half. 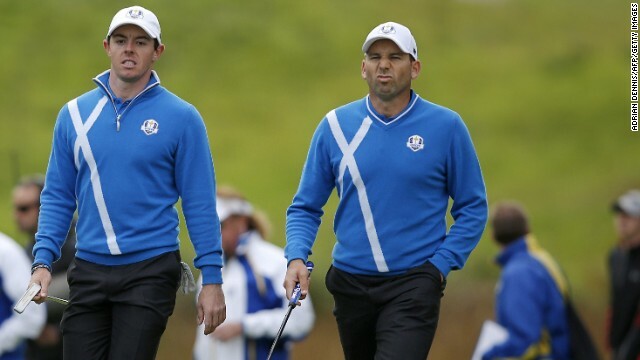 Two of the afternoon's foursomes matches, where players take alternate shots, were on the course before McIlroy and Garcia had finished their morning round. First out were a group that had all missed the morning session, England's Lee Westwood — playing in his eighth Ryder Cup — alongside rookie Jamie Donaldson, Matt Kuchar joining Jim Furyk. The U.S. were ahead after the third, but fell two behind on the 11th as Donaldson warmed to his task. 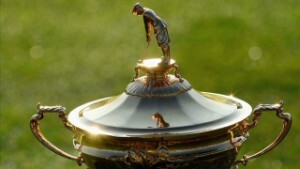 The deficit was reduced on 16, but after Kuchar fluffed a chip on the last, Europe secured a two up victory. Behind them Rose and Stenson picked up where they left off in the morning, going two up after six holes on Zach Johnson and Hunter Mahan, both fresh after a morning rest. Despite twice being pegged back to all square, Rose was equal to the test, his putting stroke proving the difference on 15 and 17 as a 2&1 victory made it a two-point day for the pair. 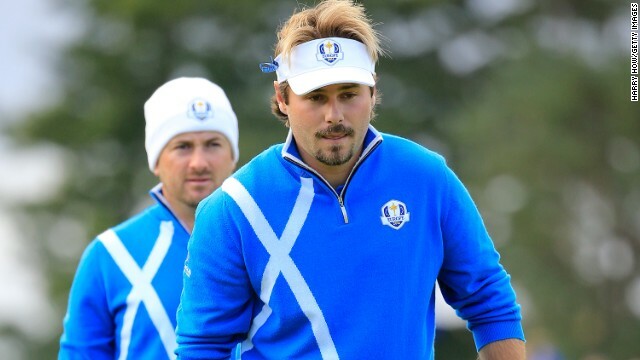 The last match out saw another test of Mickleson and Bradley's 100% record, with French rookie Dubuisson and McDowell accepting the challenge. 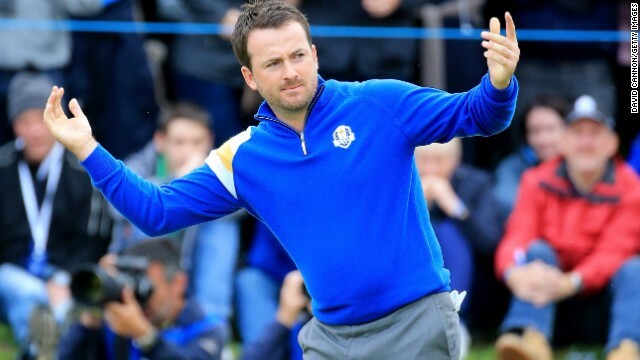 McDowell, playing for the first time in the competition without fellow Northern Irishman McIlroy by his side, played big brother to the 24-year-old as they charged into a three-hole lead. Despite having their lead dented twice, once on the front nine and once on the back, they scampered to the finish line to secure a 3&2 win and a near-perfect European afternoon. McDowell, himself a U.S. Open champion, ended the day by saying of his partner: "This guy is going to be the next superstar of European golf, I'm telling you." As the sun set on an absorbing first day, the pairings for Saturday's morning fourballs were announced. 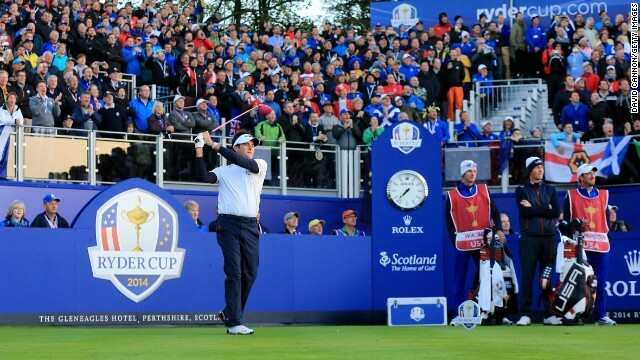 Justin Rose and Henrik Stenson will be off first again, playing Bubba Watson and Matt Kuchar. 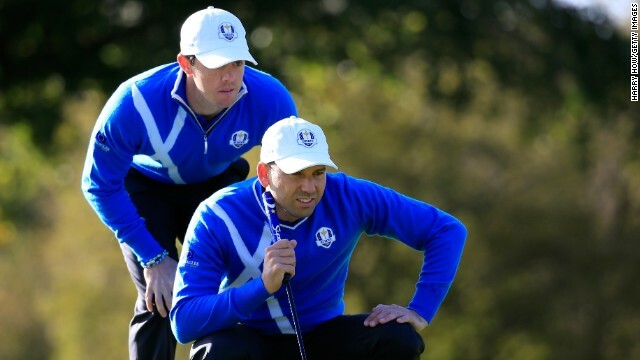 Lee Westwood and Jamie Donaldson are out second playing Jim Furyk and Hunter Mahan. 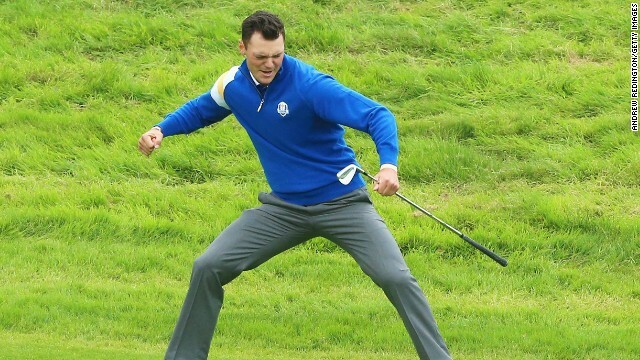 Martin Kaymer and Thomas Bjorn square off against Jordan Spieth and Patrick Reed while Ian Poulter and Rory McIlroy go off last against Jimmy Walker and Rickie Fowler.